The Canola Meeting & Canola Innovation Day, and the Canola Discovery Forum have united to create the first ever CanolaWeek! 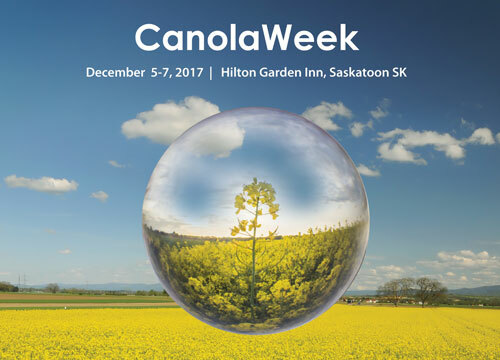 CanolaWeek comprises Canola Industry Meeting on Tuesday, December 5, 2017; Canola Discovery Forum on Wednesday, December 6, 2017, and Canola Innovation Day on Thursday, December 7, 2017. The venue is the Hilton Garden Inn, Saskatoon, SK. Join us in Saskatoon to hear experts discuss the latest developments in research, and the growing canola industry. Topics will include genomics, agronomy, sustainability, crop protection, oil and meal processing and use, and more. For information on topics and speakers for each of the meetings, or to download the program, please click on the menu links on the left hand side of the this web page. Certified Crop Advisor (CCA) and Certified Crop Science Consultant (CCSC) Credits will be available. Wilf Keller Ag-West Bio Inc.